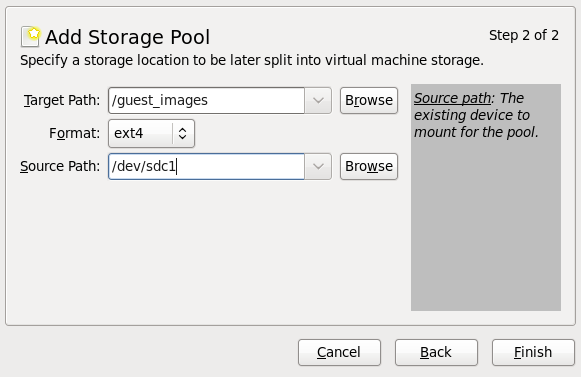 For the following examples, a host physical machine has a 500GB hard drive (/dev/sdc) partitioned into one 500GB, ext4 formatted partition (/dev/sdc1). We set up a storage pool for it using the procedure below. 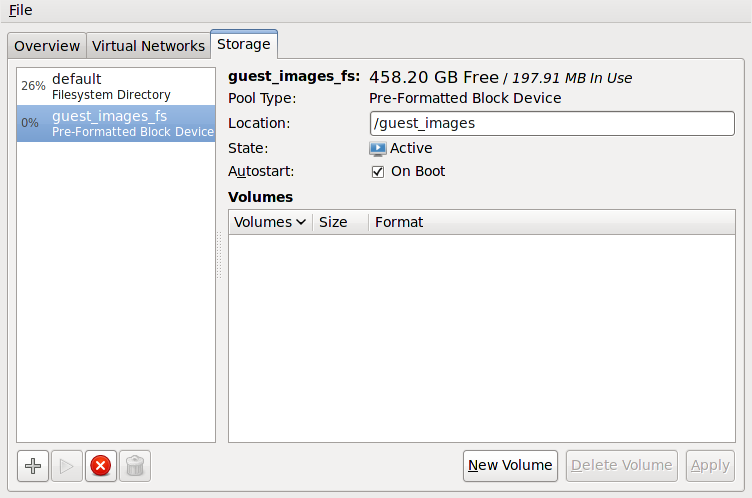 This procedure creates a new storage pool using a partition of a storage device. Choose a Name for the storage pool. This example uses the name guest_images_fs. Change the Type to fs: Pre-Formatted Block Device. Change the Target Path, Format, and Source Path fields. Enter the location to mount the source device for the storage pool in the Target Path field. If the location does not already exist, virt-manager will create the directory. Select a format from the Format list. The device is formatted with the selected format. This example uses the ext4 file system, the default Red Hat Enterprise Linux file system. Enter the device in the Source Path field. This example uses the /dev/sdc1 device. The new storage pool appears in the storage list on the left after a few seconds. Verify the size is reported as expected, 458.20 GB Free in this example. Verify the State field reports the new storage pool as Active. 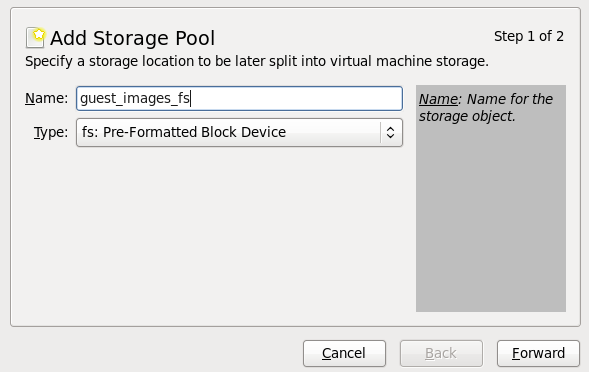 Select the storage pool. In the Autostart field, click the On Boot check box. This will make sure the storage device starts whenever the libvirtd service starts.